This second volume of a new three-part series of Antonio Negri’s work is focussed on the consequences of the rapid process of deindustrialisation that has occurred across the West in recent years. 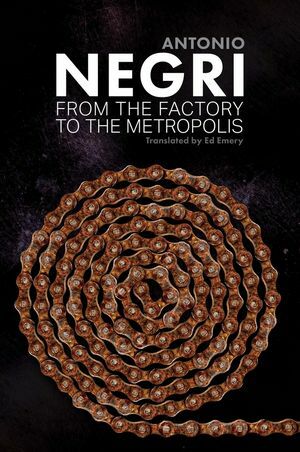 In this volume Negri investigates exactly what happens when the class subjects of industrial capitalism are demobilized and the factories close. Evidently capital continues to make profit, but how and where? 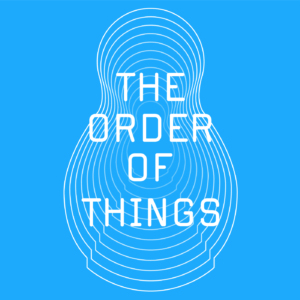 According to Negri, the creation of value extends beyond the factory walls to embrace the whole of society; the ‘mass worker’ of industrialism gives way to the ‘socialized worker’ – operaio sociale – and the terrain of exploitation now becomes the whole of human life. In postmodernity, the metropolis becomes the privileged arena of value extraction. We must therefore understand the global city, with its stratifications, its enclosures and its resistances. Old categories of the private and the public are inadequate to describe the new matrix of production, which is characterized rather by the ‘common’, the productive space of cognitive and immaterial labour. Today’s metropolis can be defined as a space of antagonisms between forms of life produced, on the one hand, by finance capital (the capital that operates around rents), and on the other by the ‘cognitive proletariat’. The central question is then how ‘the common’ of the latter can be mobilised for the destruction of capitalism. Challenging the long-held assumption that American values—be they Christian or secular—are based on “Judeo-Christian” norms, this provocative study compares ancient Christian discourses on marriage and sexuality with contemporary ones, maintaining that modern family values owe more to Roman Imperial beliefs than to the bible. Engaging with Foucault’s ideas, Wheeler-Reed examines how conservative organizations and the Supreme Court have misunderstood Christian beliefs on marriage and the family. 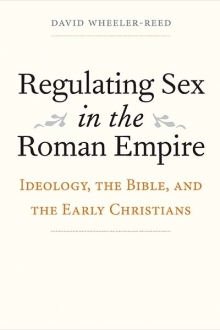 Taking on modern cultural debates on marriage and sexuality, with implications for historians, political thinkers, and jurists, this book undermines the conservative ideology of the family, starting from the position that early Christianity, in its emphasis on celibacy and denunciation of marriage, was in opposition to procreation, the ideological norm in the Greco-Roman world. Michel Foucault had been concerned about painting and the meaning of the image from his earliest publications, yet this aspect of his thought is largely neglected within the disciplines of art history and aesthetic theory. 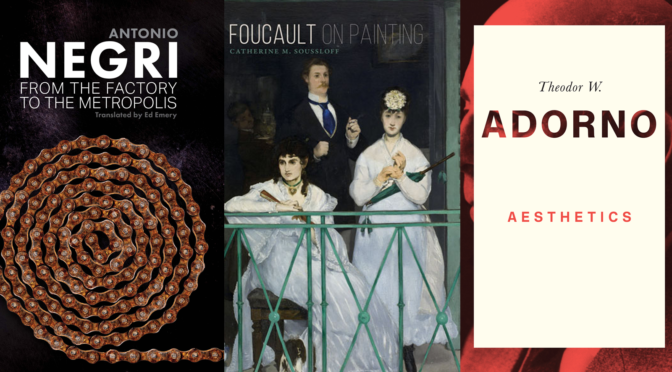 In Foucault on Painting, Catherine M. Soussloff argues that Foucault’s sustained engagement with European art history critically addresses present concerns about the mediated nature of the image in the digital age. Foucault’s writing on painting covers four discrete periods in European art history (seventeenth-century southern Baroque, mid-nineteenth century French painting, Surrealism, and figurative painting in the 1960s and ‘70s) as well as five individual artists: Velázquez, Manet, Magritte, Paul Reyberolle, and Gérard Fromanger. 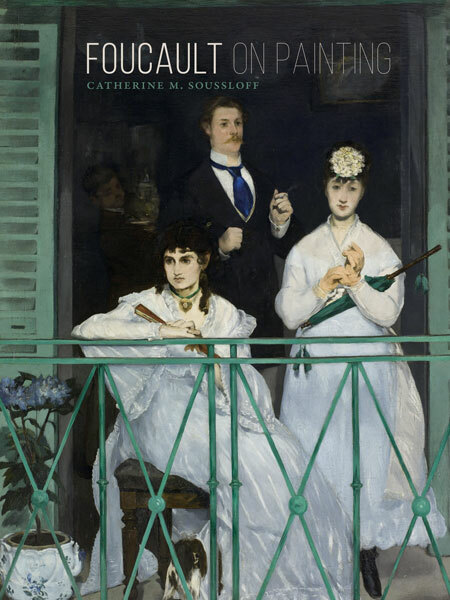 As Soussloff reveals in this book, Foucault followed a French intellectual tradition dating back to the seventeenth century, which understands painting as a separate area of knowledge. Painting, a practice long considered silent in its operations and effects, afforded Foucault an ideal discipline to think about history and philosophy simultaneously. Using a comparative approach grounded in art history and aesthetics, Soussloff explores the meaning of painting for Foucault’s philosophy, and for contemporary art theory, proposing a new relevance for a Foucauldian view of ethics and the pleasures and predicaments . Although Leo Strauss published little on Nietzsche, his lectures and correspondence demonstrate a deep critical engagement with Nietzsche’s thought. One of the richest contributions is a seminar on Nietzsche’s Thus Spoke Zarathustra, taught in 1959 during Strauss’s tenure at the University of Chicago. In the lectures, Strauss draws important parallels between Nietzsche’s most important project and his own ongoing efforts to restore classical political philosophy. 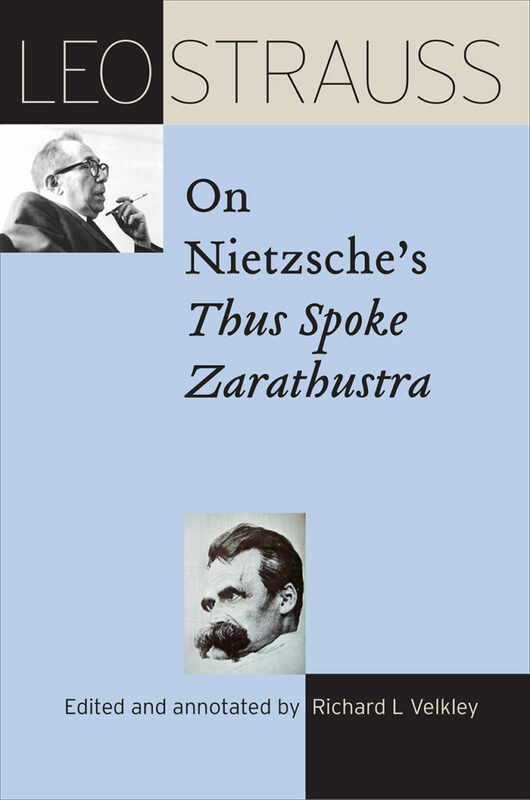 With Leo Strauss on Nietzsche’s “Thus Spoke Zarathustra,” eminent Strauss scholar Richard L. Velkley presents Strauss’s lectures on Zarathustra with superb annotations that bring context and clarity to the critical role played by Nietzsche in shaping Strauss’s thought. In addition to the broad relationship between Nietzsche and political philosophy, Strauss adeptly guides readers through Heidegger’s confrontations with Nietzsche, laying out Heidegger’s critique of Nietzsche’s “will to power” while also showing how Heidegger can be read as a foil for his own reading of Nietzsche. The lectures also shed light on the relationship between Heidegger and Strauss, as both philosophers saw Nietzsche as a central figure for understanding the crisis of philosophy and Western civilization. Strauss’s reading of Nietzsche is one of the important—yet little appreciated—philosophical inquiries of the past century, both an original interpretation of Nietzsche’s thought and a deep engagement with the core problems that modernity posed for political philosophy. It will be welcomed by anyone interested in the work of either philosopher. 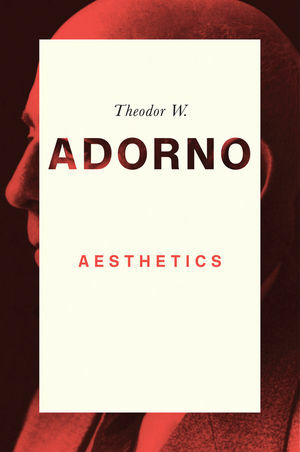 This volume of lectures on aesthetics, given by Adorno in the winter semester of 1958/59, formed the foundation for his later text Aesthetic Theory , widely regarded as one of Adorno’s greatest works. The lectures cover a wide range of topics, from an intense analysis of the work of Georg Lukács to a sustained reflection on the theory of aesthetic experience which, even after 50 years and significant changes in the philosophical debate on aesthetics, still remains very relevant. An examination of the classical interpretation of beauty in Plato’s Phaedrus , and of works by major figures such as Kant, Hegel, Schopenhauer, Kierkegaard and Benjamin, is placed alongside discussions of the latest experiments of John Cage, showing the virtuosity and breadth of Adorno’s engagement. All the while, Adorno remains deeply connected to his surrounding context, offering us a window onto the artistic, intellectual and political confrontations that shaped life in West Germany during the Cold War. Anthropologists, psychologists, feminists, and sociologists have long studied the “everyday,” the quotidian, the taken-for-granted; however, geographers have lagged behind in engaging with this slippery aspect of reality. Now, Rob Sullivan makes the case for geography as a powerful conceptual framework for seeing the everyday anew and for pushing back against its “givenness”: its capacity to so fade into the background that it controls us in dangerously unexamined ways. 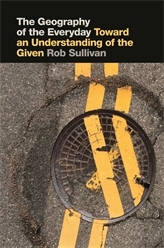 Drawing on a number of theorists (Foucault, Goffman, Marx, Lefebvre, Hägerstrand, and others), Sullivan unpacks the concepts and perceived realities that structure everyday life while grounding them in real-world cases, such as Nigeria’s troubled oil network, the working poor in the United States, China’s urban villages, and ultra-high-end housing in London and Cairo. In examining the everyday from a geographical perspective, Sullivan ranges widely across time, space, history, geography, Marxian reproduction, the body, and the geographical mind. The everyday, Sullivan suggests, is where change occurs and where resistance to change can begin. By locating the everyday through geography, we can help to make change possible. Whatever the issue, be it struggles over race, LGBT rights, class inequality, or global warming, the transformations required to achieve social justice all begin with transformation of the everyday order. Increasingly, anthropologists, political theorists and philosophers are calling for imaginative and creative analyses and theories that might help us think and bring about an otherwise. 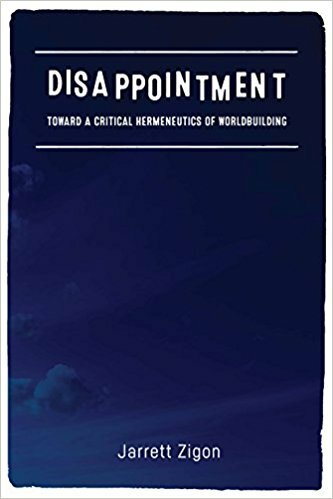 Disappointment responds to this call by showing how collaboration between an anthropologist and a political movement of marginalized peoples can disclose new possibilities for being and acting politically. Drawing from nearly a decade of research with the global anti-drug war movement, Jarrett Zigon puts ethnography in dialogue with both political theory and continental philosophy to rethink some of the most fundamental ontological, political and ethical concepts. The result is to show that ontological starting points have real political implications, and thus, how an alternative ontological starting point can lead to new possibilities for building worlds more ethically attuned to their inhabitants.